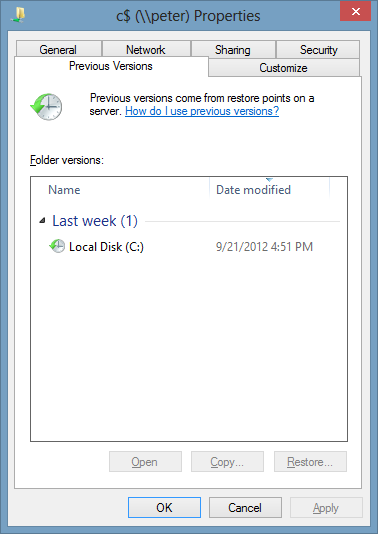 In Windows Vista and Windows 7 there was a "Previous Versions" tab on the properties dialog of folders. This could be used to recover a previous version of a file that has since been deleted or changed. This can be an invaluable feature but Microsoft replaced it with the "File History" feature in Windows 8. While File History is good, it doesn't have all the features that Previous Versions did. File History requires an extra drive or network location to be used to store many versions of folders on your computer and makes copies at a much faster rate than Previous Versions. This has the added benefit of being able to recover them if your drive fails. Previous Versions stores the history of files on the same drive that they're on so if the drive fails, you will lose the files if they aren't also stored somewhere else. So if you only have one drive which you probably do on a laptop, you can't use File History unless you have an external drive connected. 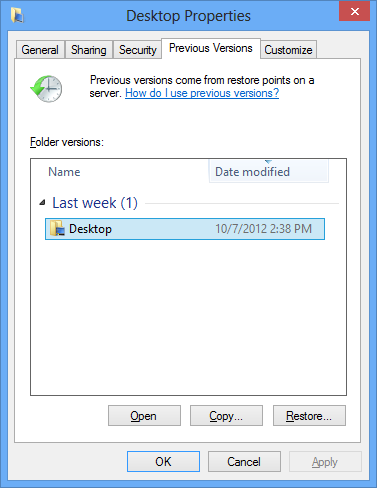 Click Read more to find out how to re-enable Windows 7-style Previous Versions. To re-enable the Previous Versions feature from Windows 7 you will have to do some work if the drive you want to recover from is not the system drive which is the only drive protected by default. 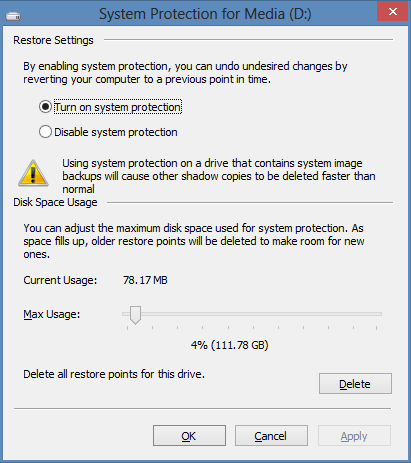 If the file is on the system drive, you may skip to the "Recovery" section below. Note that this has to be done before you need the feature if the drive isn't the system drive. If you have already deleted a file you need recovered, it will not be there if it was not on the system drive. To enable protection, first you will need to open the System Properties dialog. The quickest way is to use the start screen. Mouse and keyboard users press the windows key or click in the bottom left corner of your screen. Tablet users swipe in from the right to open the charms bar and press search. Type in sysdm.cpl and press enter. The following dialog will appear. 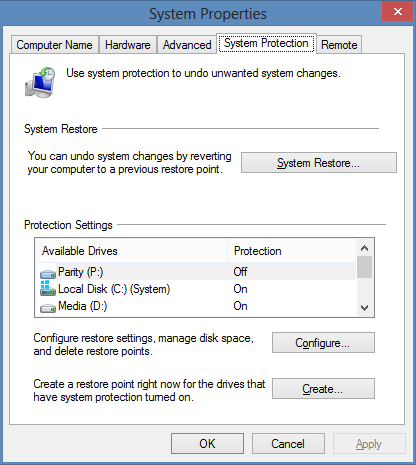 Next look at the drive you want protected from the "Protection Settings" list. 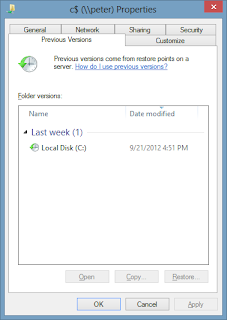 The Protection column must be "On" for the files on this drive to be protected and to have previous versions available. If it is "Off" or you want to configure the protection settings, click on the drive and then press the Configure button. The following dialog will appear. Make sure "Turn on system protection" is selected and adjust the "Max Usage" slider to the desired level. This controls how much storage System Protection will use before deleting older versions to make room for newer versions of files. The larger the Max Usage, the farther back in time the previous versions will be stored. Press Ok on both dialogs to apply the settings. Now to access previous versions open a file explorer window. In the address bar type \\localhost\C$ and press enter. You can replace C$ with any drive letter and the dollar symbol if the file is on a different drive. Next navigate to and select the folder which contains your deleted file and open the properties dialog. This can be done by pressing the properties button in the Home tab. Select the version of the folder you want to open and click the Open button. This will show you the version of the folder at that date and time. You can copy any file you want out and back to where you want to put it. What this is doing is accessing your local computer as if it were being accessed over the network. Apparently Microsoft left the previous versions tab in the properties dialog if the folder was being accessed over the network. This was probably to support Previous Versions on older versions of Windows and they forgot to check if the computer is running Windows 8, or for any other reason. Either way, it's useful. An alternate method of recovering files is to use ShadowExplorer. 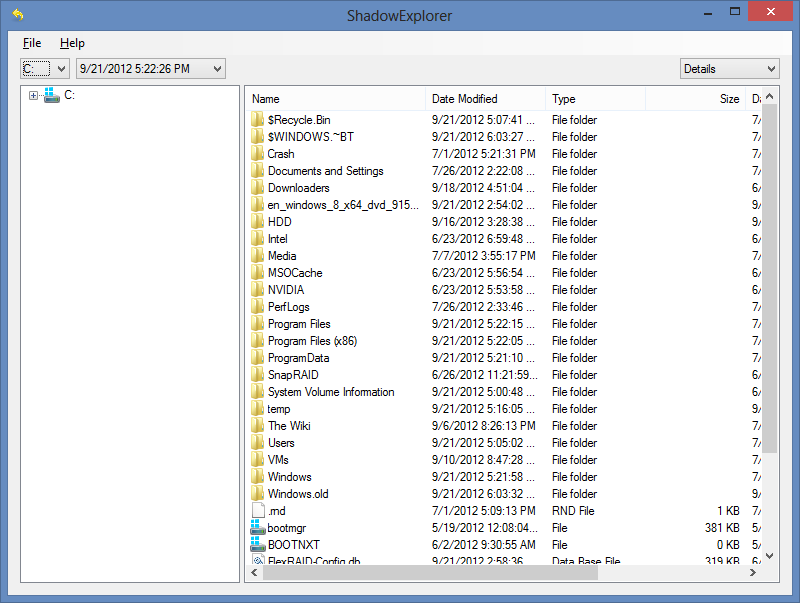 Alternatively, you can use a third party tool called Shadow Explorer. Click the link to download it. Be sure to get the latest version. Install Shadow Explorer and run it, it will look like the above image. 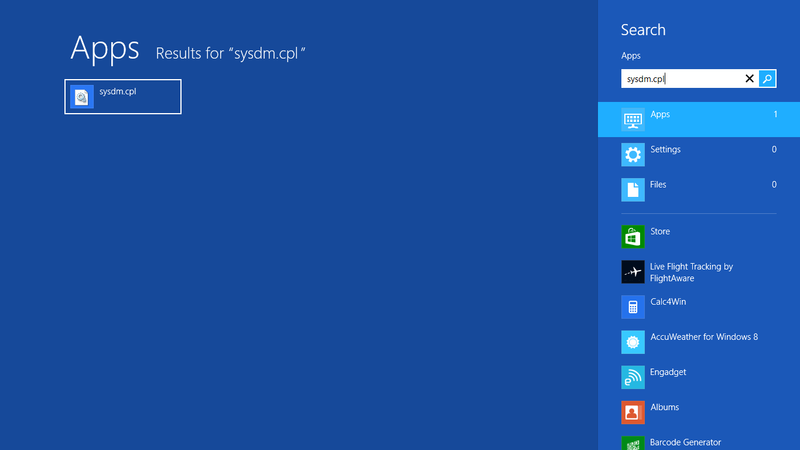 First select the drive you want to recover a file from from the drop down list next to the File menu. Then select the date of the copy you want to recover the file from. After that, you browse to where the file is located. Then you right click the file and select Export. Choose where to recover the file to and press OK. Your previous version should now be restored. 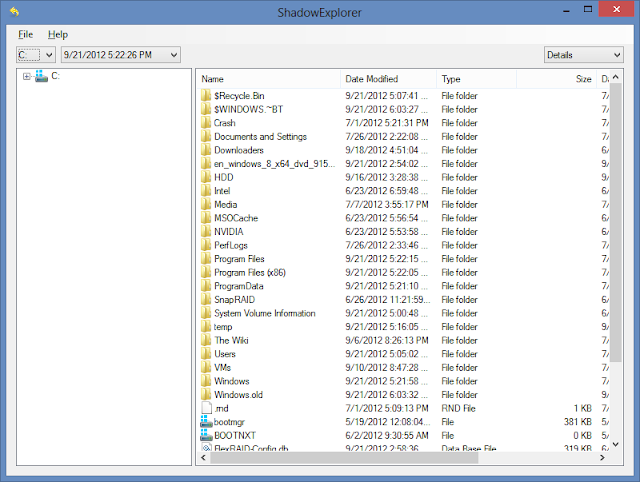 Previous versions says there are no previous versions available, but ShadowExplorer shows my previous files just fine. Why would this be? This is not working. I tried that with Windows 8 and I didn't get any previous files.. should have. and I tried hard as it was well presented. Thank you so so much. This really helped even with the "Shadow Explorer" that helped restore the actual file. I'm having the same issue as Arrow_Raider. Shows previous file in shadow explorer but not in previous versions? Any help with this? As and administrator, I am wondering how Microsoft is forgetting to put this little fellow in windows 8 as we had in windows 7, Some how I used this method \\localhost\c$, and mapped all the drives I want to have previous versions of files. Mapping seems to be the easiest where as it look really dirty inside "Computer", but have no other option. Thanks for the help. This worked great. I have never find this information before. Great post! Did not work at all. Tried shadow explorer. That didn't work either. Please help. Thanks for the detailed guides; I used the Shadow Explorer, it worked like a charm!!!!!!!!!!! We are the fastest growing organization in the present market and providing the technical support for the customers’ computers across the globe. I turned this feature off as it filled up one of my backup hard drives and I didn't think I needed it as I was using a backup program to backup our data. It seems that by turning this feature off, it has deleted around 60% of all my critical data. I can see that the backed up data is still on the drive, but to be able to restore it back to how it was, I would need to turn the feature back on and I'm scared that it will delete the history or do something else unexpected. ANY advice would be very much appreciated as this is something my late husband set up and I am trying to resolve. Thank you so much. Thank you for showing me how to get back one of my favorite features of Windows 7!! You can buy the product key from the Microsoft office site and its partner vendor. If you don't want to pay in high price, then I recommend you to buy it from the partner vendor http://www.MsKeyHome.com/ . The same genuine product key but with a much lower price. What's more, the customer service is extremely good and considerate. Generally speaking, we can disable the Previous Versions tab on individual client computers by adding the corresponding registry key. 4. Type NoPreviousVersionsPage, and then press ENTER. 5. Right-click NoPreviousVersionsPage, and then click Modify. Please copy the following content in a startup.bat file to combine a user startup script. Alternatively, you can create a GPO to deploy the user logon script to distribute the script to affect on those users. If you have installed a non activated version of Windows 8.1 then here I will let you go through the process how to activate windows 8.1 using 100 % working windows 8 product key or serial key. You can only avail full features of Windows 8.1 after activation of your version of windows. If someone need windows 8.1 key can go link https://win8stuff.jimdo.com/ to get it. My windows work great after I used the key from it. It's not legal to activate your Windows 10 Enterprise Product Key without a product key. It is not as difficult as you image to solve this problem. Why not just buy a genuine product from theMicrosoft official site or its partner site https://www.cdkey4u.com/ . Same product and lower price with more effective service and support. This is my personal experience and hope this also can help you.